One of the smartest tools you can have in your relationship-building arsenal is a newsletter. It doesn’t matter if it’s electronic or printed, this regular connection with your audiences is one of the most important assets your organization can develop. 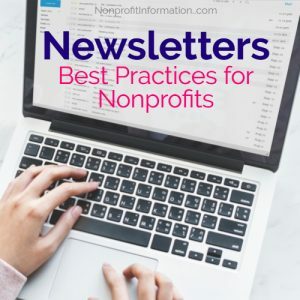 A newsletter is a regular and reliable publication produced by your nonprofit organization that shares valuable news and information with your audiences. The key is to present the information in a way that is aligned with the reader’s self-interest. This is no small point. A mistake too many organizations make is droning on and on about themselves without advancing their business goals with the reader. Producing a newsletter may sound old school, given all the platforms and ways we can stay in touch with audiences. But here’s why relying on external platforms, without developing your own, is risky and why you need to think about a newsletter in a new way. If Facebook or Twitter or Instagram collapsed tomorrow, all your content and contacts would vanish. Not so with a newsletter. If you regard your newsletter and its subscriber list as assets, you’d focus much more of your time and effort on building your newsletter. In fact, it’s one of the most important activities of your marketing initiatives. Your development team only has so much time and energy available, especially if that department is one person or smaller. The development office has to focus on the highest value relationships—in other words, donors with the highest giving capacity. They are not able to spend as much time with donors who contribute smaller amounts. Herein lies the rub. These smaller donors are still critical to your organization, especially if you’re a membership organization or need demonstrable proof to another entity that you’ve got community support. And you never know when these smaller donors turn into larger ones nor who else they know. Your newsletter then is the virtual (or paper) representation of your organization that gets out there to cultivate your relationships. Here are seven tips to make sure you create your newsletter using best practices. Know your audience. Why are they connected with your organization? What do they need to know? What do you hope to gain by communicating with this group? Write for your audience. Gear the content to your reader. If your audience is too diverse, consider multiple newsletters. Short and to the point. Everyone’s busy. Keep it brief and pithy. Use images. People learn in different ways. Interesting photos make your newsletter interesting to read and look at. Hire a graphic designer. Poorly designed newsletters will be deleted (or thrown in the trash). Invest in resources to make sure your newsletter gets read. Be regular and consistent. It’s how you build trust. Sum of the parts creates the whole. Showcase multiple areas of your organization so that you’re building a relationship, communicating lots of interesting tidbits, underscoring your success and impact, and engaging your audience. First determine whether having a newsletter is aligned with your organizational and marketing strategies. Then make a commitment to get started. Spend time conceiving the purpose, brand, and regular features of your newsletter. A staff member or team must take responsibility and be accountable for producing it with the support of external resources, as needed, on a regular basis. Whether it’s in-depth and periodic or short and frequent, have fun with the newsletter and with engaging the important people in your community.